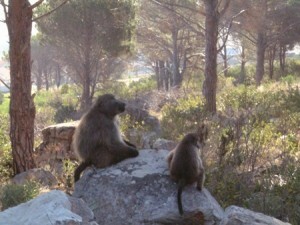 One of the big ongoing conflicts on the Cape Point Peninsula is that between humans and baboons. It is sad and tragic that Cape Points two simian neighbours cannot live in peace, learning from each other. Wisdom dictates that one proves their humanity and strength, not by proving your dominance but through understanding, patience and accommodation. That this is not the case with our relationship with the Cape Point Baboon population is a clear indicator of the sickness within the current human condition. Strength is linked to success that is in turn linked to material possession. Hence our willingness to destroy an intelligent, complex species so that we may claim complete control of those areas of the Cape Point Peninsula that we wish to call our own. Make no mistake, these are highly evolved, intelligent, social animals. I recently came across a report into a study done into the ability of baboons to read. And it turns out that they may have the word recognition abilities of a 3 year old! The research is being conducted by French behavioral scientist Jonathan Grainger. Baboons are shown combinations of letters on a computer screen. They are trained to recognize patterns in these letters, finally being able to discern which patterns make up words and which do not. The success rate of the baboons is 75%, which is roughly equivalent to how a human three year old would perform. This does not mean that the baboons of Cape Point are going to be stealing your copy of the Cape Times, they lack the abstraction of thought needed to associate patterns with objects and memories. However it does point to the fact that our Cape Point neighbours are far more intelligent than previously thought. Such research surely shows that our biggest lesson to learn if we want to survive as a species is not that we are the dominant creature on earth, with a literal God given right to rule all other creatures, but that we are merely on a scale of intelligence that we should be at the top of. And we need to start acting like the most intelligent creature on the planet rather than the barborous thugs that we prove ourselves to be on the Cape Point Peninsula. Recent programmes using paint balls to supposedly frighten away baboons from Scarborough leave me saddened. What the baboons thought was going on is anyone’s guess, but it is impossible to believe that there has not been some kind of psychological trauma. And what did the children who witnessed this show stupid brutality learn? There is certainly a conflict between the Cape Point Peninsula’s two simian neighbours, and short of eradicating one of the two antagonists (lets face it, it would be the baboons that would have to go, I can’t imagine how the rich land owners of the Cape Point could be convinced to move to the cape flats) there is never likely to be a perfect peace. However, is that the limit of our imagination, intelligence, humanity and compassion; that our only solution to the problem is to flex our muscles and use force to remove the baboons. That it was an abject failure is easy to see, that it will be tried again- probably inevitable. Do we in fact defer our own supposed intelligence by not seeking a peaceful, coefficient solution so that we coexist in relative harmony with the baboon populations of the Cape Point Peninsula. Should we in fact be reassessing our definitions of intelligence? Our ability to learn, read and write, add numbers and communicate through complex language are merely highly developed functions of our own instincts and survival tools. And many of these traits are shared by our Cape Point neighbours. Are the Cape Point Peninsula baboons not also intellegent? They certainly seem to be giving us the run around, seemingly making us resort to our only fall back- violence and brute strength. So who is the Cape Point s most intelligent simian? This entry was posted in Environment, General information, Uncategorized, Wildlife. Bookmark the permalink. Well put Russell, I really cannot understand how paintball guns seems a viable option. It is disturbing to say the least. The baboon monitoring happening in the area needs to incorporate a better management system (a better HUMAN management system), for them to understand the baboon population in the area (anciently settled) and that baboons will settle if the high-nutrient food source (commercial food) is plentiful. I suppose it is easy for me to say being so far away (the other side of the mountain) but surely the human population has to turn and look at their own habits before blaming it on the baboons. Perplexing. good article Russell, I agree paint ball guns are a bad idea those things really hurt i can imagine they will injure the young baboons and enrage the bigger ones. i think more education and tolerence is necessary. Yes, I know first hand how painful they are, and they leave a bruise the size of a fist. Also, the notion that you can fire a paint ball gun acurately enough to hit the ground in front of the animals is crazy. I haven’t heard of any repeat performances, maybe they are just doing it quietly- but I don’t think so because they think that they are right.